For a poet, there are easier things than translations. The translating poet inevitably has to face the gnawing burden of writing for two people. “It’s a desperate system of double-entry bookkeeping,” Howard Nemerov lamented. The spectral presence of the author is always hovering somewhere, ready to strike whenever the nuance of a word or phrase falters. Even then, the process of translation is seductive. It provides a poet with the rare opportunity to examine the art of another writer, often with intriguing results. The cryptologist’s glee at unveiling messages and new lines of thought converge into the creation of a new kind of work that is as dependent on the translator’s moment in time as much as it is to the author’s. Many readers may be familiar with Ciarán Carson’s work as translator. His versions of seminal Irish texts Táin Bó Cúailnge (The Cattle Raid of Cooley) and Cúirt An Mheán Oíche (The Midnight Court) have a robust freshness and vitality that readily appeals to contemporary audiences. Reading Carson’s Táin, one can sense the sounds, smells, and voices of that particular world of pre-Christian Ireland (now so heavily appropriated into the pop-culture fabric of Game of Thrones). His newest work, From Elsewhere (Gallery Books, 2014), is a collection of 81 short poems by the French poet Jean Follain (1903-1971), each accompanied by a short poem of Carson’s, an original work inspired by the Follain poem, or, as Carson describes it: “a translation of the translation.” From Elsewhere is certainly not Carson’s first foray into French translation. In 1998 he translated an array of Rimbaud, Baudelaire, and Mallarmé in The Alexandrine Plan and in 2012 he published his translations of Rimbaud’s Illuminations, In the Light Of (both published by Wake Forest University Press). Carson brings a certain sharp vitality and contemporaneity to his translations compared to those of Oliver Bernard and John Ashbery. He transposes his experience of Belfast, in its own way, a heaving, Gothic, ghostly metropolis, into his vision of nineteenth-century Paris, and his memories of Belfast shattered by the Troubles into Follain’s haunted visions of his native Normandy, scarred by the Second World War. Carson is a skilled formalist. His poetry collection, Belfast Confetti (Wake Forest University Press, 1989), famously showcased his adroitness with the long line (partly in homage to C.K. Williams). The opening poem of that collection, “Loaf,” involving Carson’s memories of food, heady conversation, and the onus of writing in Belfast in the late 1960s and early ‘70s, is a tour-de-force of expansive energy and rhythm. Even today, in From Elsewhere, we’re shown what Carson can do with concision, which is a great deal indeed. The Follain poems, supplied with their original French titles (though the poems themselves only appear in the translated English, not in French) are the sounding-board for Carson’s poems, which range from his memories of Belfast during the Troubles to his meditations on light, landscape, and the endurance of art. to the sound of their own applause. One of the most enjoyable features of the Carson’s approach to translating Follain is the way in which he approaches the more conspicuously quiet Follain poems. Follain’s “old lady,” his aproned artist, is rendered in the loving gaze of a Vermeer or Chardin portrait, where we share the sitter’s concentration of an object, as she begins to understand something of the otherness of the world. The only thing missing in this beautiful volume of translations and poetry are the Follain poems in their original French. When W.S. Merwin completed his masterful translations of Follain’s poetry, The Transparence of the World (Copper Canyon Press, 2003), the volume contained the French poem printed alongside Merwin’s translations, enormously helpful to the discerning reader who could share the poet/translator’s discovery. Strikingly, “sombre” with Merwin is more in line with the literal French, which suggests “shadowy” or “gloomy.” Carson strips the atmosphere in that small café from its illusions and gives us a “drab” place. He also takes a certain liberty by showing us that the lonely customer is drinking a glass of cheap wine, though the Follain poem, which Merwin translates here, simply says “verre” or “glass,” though of course it seems unlikely that this solitary figure would be drinking something else. Carson has tried quite deliberately (and successfully) to set his translations apart from Merwin’s. Here, as with his translation of the Táin, Carson brings to his work a certain flinty directness that highlights its emotional tensions in unexpected ways. “When one translates one cannot avoid taking liberties of one kind or another, “ Carson writes in his introduction. “Perhaps one takes a special liberty in translating Follain, whose attachment to his native language was such that he declared himself unable to learn any other.” This is perhaps more than a mere apologia; It is Carson’s way of coming to terms with the inherent difficulties in translating poems and in the great freedom that it can sometimes bring to writers to build upon the work of another. 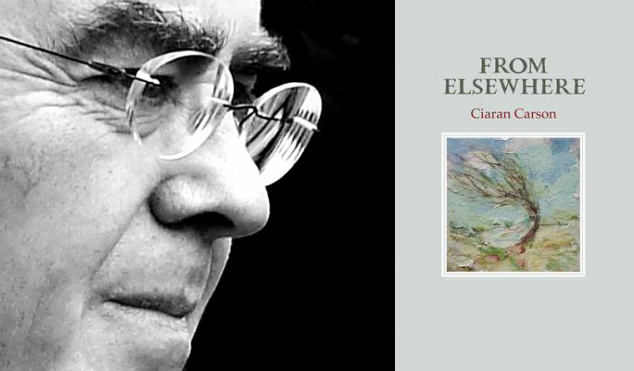 It would be remiss and painfully amateur of me to suppose that the Ciarán Carson translations of Jean Follain’s poems and his accompanying original poetry are like savoring two different, but remarkable, vintages of the same fine wine, but what is striking about From Elsewhere is that it allows the discerning reader to glean a sense of what translation does. Thinking in and out of different languages can be potentially inspiring and liberating, something that many Americans (I am often guilty of this myself) forget to do on a daily basis because of the relative global hegemony of English. except that it throws back.